Crankshaft pulley holding tool – Jaguar No.303-D055. Flywheel locking tool – Jaguar No.303-698. Universal flange holding wrench – Jaguar No.205-053. 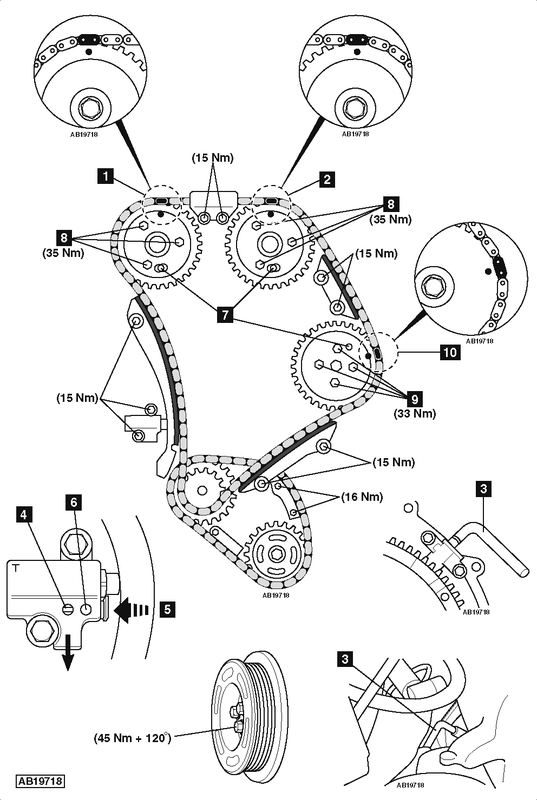 Turn crankshaft clockwise until timing mark on each camshaft sprocket at 12 o’clock position  &  . Remove crankshaft position (CKP) sensor. Fit flywheel locking tool  . Ensure flywheel locking tool installed. Insert 6 mm drill bits into camshaft sprockets and injection pump sprocket  . Slacken bolts of each camshaft sprocket and injection pump sprocket bolts  &  . Tighten injection pump sprocket bolts  . Tightening torque: 33 Nm.